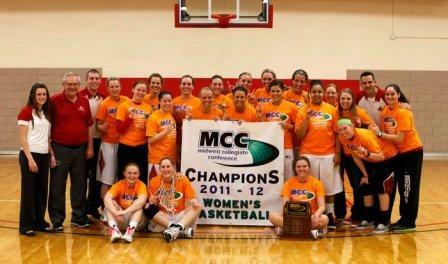 This has been one of the greatest years ever for Grand View women’s basketball. The team finished 28-5 and 17-1 in the Midwest Collegiate Conference. The 7th ranked Vikings are riding an 18 game winning streak, including 20 straight in league play after winning the conference tourney. Grand View has been lead by their All-American Senior Jenn Jorgensen. The Dayton, Iowa native (Burnside SE Webster) leads the nation (NAIA D1 and D2) in total scoring with 775 points and is 2nd in average at 23.5 ppg. Jorgensen is 8th in rebounding (10.3) and is 3rd in steals (3.24). Jenn was also named as the “Academic All-American of the Year” by COSIDA. (This includes NAIA, Canadian and 2 year institutions). She has a perfect 4.0 GPA. Jorgensen was named Midwest Collegiate Conference Player of the Week SEVEN times this season. She was named First team All-American last season (Third team in 2010) and is a sure fire First team pick again this year. Jenn also stands 30 points away from 2,000 career points. The biggest difference from last year’s 14-17 team to this year’s squad has been depth. It’s been a “3 headed monster” this season. Junior’s Morgan Hamner (12.6) and Amy Vos (10.2) have been great contributors to the team’s success. Vos was named 2nd team “Academic All-Amercan” by COSIDA. Amy also carries a perfect 4.0 GPA. Adding to depth has been the role players. Grand View has four players who average 4.0 points per game. Nicole Wilson (4.7), Abby Mendlik (4.4), Shelbie Beatty (4.2) and Karissa Shindelar (4.0). Aimee Osborne (3.5) and Kristin Rasmussen (3.2) are next in line. Rasmussen also averages 3.5 assists per game. For me the turning point in the season was the double overtime win at Viterbo on January 14th. At the time Grand View and Viterbo were both 5-1 and tied for 2nd in MCC play. The Vikings scored field goals in the final 10 seconds of regulation and the first OT to force a second OT before opening up a 10 point lead in the final 5 minutes of the game to win 78-74. The Vikings have won the close games. Nine of their final twelve games were decided by less than 10 points. That is huge heading into play in Sioux City. This team showed poise and confidence whenever games got close. One other nugget: All but one player is from the state of Iowa (Freshman Heather Greer is from Oklahoma City). Grand View will play the final game of the first round Thursday night at 8:45 against 22-10 College of St Mary (Omaha). Good luck ladies! Congratulations on a fantastic season! Let’s keep it going! If you can’t make the trip to Sioux City, hope you can listen in on 88.1 FM in Des Moines or online at gvvikings.com.